Hyderabad: The efforts of the Telangana State government to legalise rural medical practitioners by allowing them to treat patients at PHCs after 6 months of training, has met severe backlash from the doctors in the state. Medical DIalogues team had earlier reported that the Health Medical and Family welfare department of the state took out a government order to empowering the paramedical council to give training to Registered Medical Practitioners as well certain Private Medical Practitioners in order to equip them to work as Community Paramedics. The move had not gone well with the allopathic doctors in the state, who have accused the government of promoting quackery in the state. The Indian Medical Associations has condemned the State government’s decision to provide legal rights to RMP and PMPs. Medicos at Osmania Medical College recently took out a protest march against the said order Dr G. Srinivas, a senior resident doctor with the Medical college Hospital told Deccan Chronicle, “We work hard to earn a degree, while those less qualified practise in villages. They are now going to receive training and certificates. This is not fair. They will claim that they are qualified doctors with the government certificate. Moreover a petition has been filed against the state government order by the Healthcare Reforms Doctors Association terming the government order as irrational, haste, arbitrary adding that it is in clear violation of section 15 (2) (a) & (b) of the Indian Medical Council Act. The petitioner has pointed out that under the aegis of the said GO, certain unqualified persons have been practicing allopathy medicine unauthorizedly treating patients in the name of first aid in unauthorized centres both in rural and urban areas without registration. The respective district authorities have no check over the said centres. The petition further stated that the RMPs and PMPs do not possess any qualifications for practicing allopathy medicine and that bringing such unqualified persons into the mainstream has diluted the quality of medical care. It is submitted that the RMPs and PMPs have flouted the guidelines framed in the aforementioned government order and have grossly misused the said G.Os. 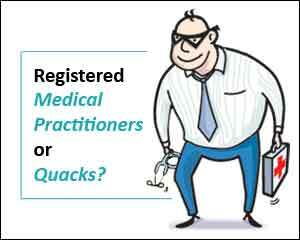 PMPs and RMPs are illegally misusing the word “doctor” before their names in the prescriptions, the name board of their clinics or first aid centers and are deceiving innocent tribal/rural people by misrepresenting to them that they can cure all kinds of diseases and provide all kinds of Medical Services that doctors provide. Further, RMPs and PMPs are using beds in their clinics or first aid centres and are admitting persons as in-patients and are providing Medical Services such as injecting saline, prescribing unwanted and unnecessary schedule medicines such as antibiotics, steroids in high dosage, conducting blood tests and performing deliveries to pregnant women and are playing with the lives of ignorant and poor rural and tribal people. The RMPs / PMPs have even started their illegal operations in urban areas. Bar and Bench reports that Justice Ranganathan agreed that this was indeed a problem and that he had first-hand experience of the same. However, he observed that dismantling the entire apparatus would be akin to “using a hammer to swat a fly”, and that to get them to fall in line was the solution. The court has given time to the state until November 21 to file a counter affidavit.